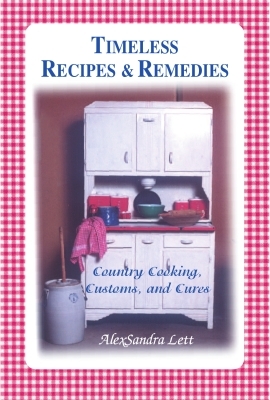 AlexSandra Lett's third book, Timeless Recipes & Remedies, Country Cooking, Customs, and Cures, captures the enticing aromas and delicious flavors of favorites ranging from hard-to-find recipes from a country kitchen in the 1920s to modern culinary creations. The book also explores common sense cures from Grandma's cupboard and healing aids from Grandpa's country store. Readers will feel the love in these stories about family, friends, food, and folklore...after all, love is the most important ingredient in all recipes and remedies. The book's humorous anecdotes and amusing reflections encourage readers to honor their family's heritage and community customs and recall memories of home, sweet home.